It is no secret that getting rid of a used sofa or couch sleeper can be difficult. Upholstered furniture may not find many takers, especially when it is damaged, torn, or stained. It can be frustrating to think about the fact that you once paid good money for a piece of furniture that now seems to be of no interest to you or anyone else. Unfortunately, with the exception of leather, upholstered furniture can depreciate greatly with use. It is difficult to get rid of it, even when you're not looking to make money. So, what is a sofa owner to do other than abandon his unwanted furniture by the road? As it turns out, there are plenty of options before simply sending it to the landfill. While it is difficult to sell used upholstered furniture at a garage sale or yard sale, it is not impossible. To a great extent, it depends on the condition of the piece. Only consider selling if it is in reasonable shape. Here's a good way to gauge the condition: if the tables were turned, would you want to buy it? If you feel your sofa is in good enough shape, get it cleaned professionally before holding your sale. It may not fetch big bucks, but it will sell more easily. And if you have the ability to transport the couch for anyone who buys it, it will go a long way to coaxing a buyer into taking it. If you have many items to sell, a garage sale can be a good place to sell your couch, since such sales usually draw a good crowd of people looking for exactly this kind of bargain. Consider placing your used couch in a church, community center, or school rummage sale. Your participation might involve little more than hauling it there, which eliminates any worry about organizing a sale on your own. Consider this if your sofa happens to be the only item you need to sell. 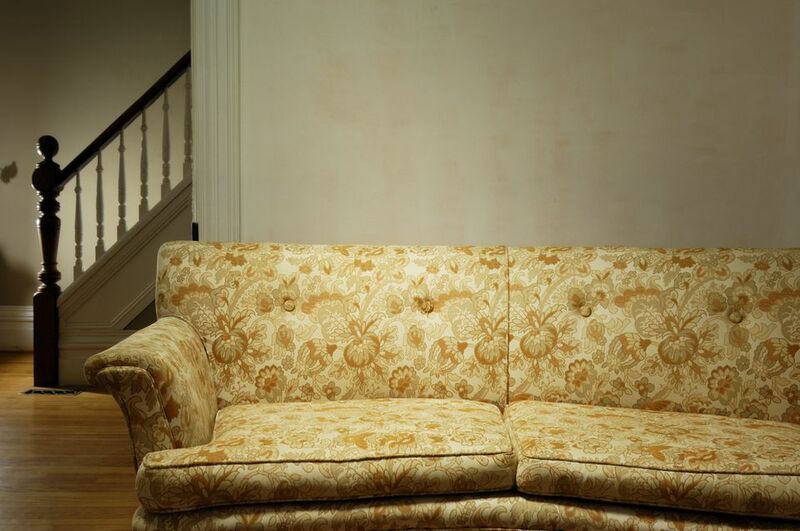 There are numerous online resources that can help you get rid of your used sofa. Craigslist, eBay, and www.freecycle.org are some of them. Online neighborhood bulletin boards, such as NextDoor, is another place to post your notice. You can try either selling it for a reasonable fee or giving it away for free. Don't forget to mention whether you can deliver the couch or if the buyer will need to pick it up. If possible, post a photo showing your couch along with the notice. Some stores will take your old couch if you are buying a new one from them. It's always worth asking. It's possible they will give you a dollar credit against the cost of your new furniture, or, they may simply agree to remove the old couch as an incentive to buy new furniture. A used couch that is well-constructed and in decent shape is more likely to be of interest to the store, as they may be able to resell it. Some stores may recycle the materials used in the couch, while others will simply send it to the landfill. Ask friends and family if they have any use for your sofa. Chances are someone might, especially if they have a young scholar heading to college soon, or if they know of young adults seeking to outfit a first apartment. If you live in a college town, college students might be your best takers. Students are always looking for furniture that is cheap or free. Posting a notice on a public bulletin board in a local business or on an online forum serving a college community may be the best way to get your message seen. Charities like Goodwill, Salvation Army, or Saint Vincent DePaul may be eager to take your furniture off your hands. Most charities will arrange a pick-up from your home and even give you a receipt to use when you itemize charitable deductions on your tax returns. Vocational/technical schools may take good furniture that needs repair or reupholstery to provide their students with practice opportunities. Check to see if you have any furniture banks in your town. They will also haul away your sofa, give you a tax receipt, and find a new home for your unwanted piece. You may also consider donating to a shelter for the homeless, your local theater, or school. Try everything you can to prevent any furniture from going to a landfill, but if your couch is badly damaged and beyond repair, have it hauled away. Consult your city before you dispose of it on your own. Many cities will have services for hauling away your items, sometimes for a fee. In some cities, used furniture gets recycled by the solid waste department, which is better than sending it to a landfill. Buy a good quality sofa: This should lessen your need to get rid of it anytime soon. If you do need to sell it for some reason, you will be able to find more takers due to its high quality. After bringing your new furniture home, take good care of it: It will last longer and should be easier to sell when you need to do so. Repair furniture as soon as it needs it to ensure that it lasts a long time. Consider reupholstering: This may not work for everything, but if you have a good-quality sofa with a sturdy frame, reupholstering is definitely an option. Combined with any necessary structural repairs, reupholstery gives you a couch that is practically new. Use slipcovers: They often end up being less expensive than reupholstering and can be custom-made or bought ready to use.